I was at the RIBA on Tuesday night for the New Norwegian Architecture Lecture and the launch of an exhibition, Contemporary Norwegian architecture: Landscapes and interventions. There were two speakers from Reiulf Ramstad Architects and Jensen & Skodvin. Both presented a series of projects in rather rushed twenty minutes sessions which focused on the relationship between physical context and built form; particularly evident in a series of government funded commissions for small projects that populate the more remote parts of the National Tourist Routes. 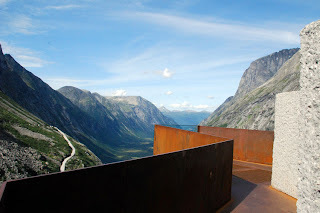 These interventions vary in scale from a lay-by in a forest through to elevated viewing platforms that provide unprecedented views of the dramatically beautiful Norwegian landscape. 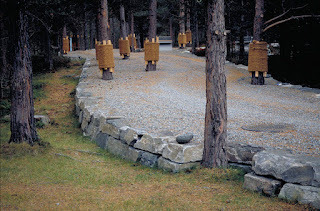 What was particularly interesting about these projects was the way that they have been procured; no PQQ’s here, but instead a strong desire on the part of the government to provide opportunities for smaller, emerging practices to gain experience designing buildings for people to use and enjoy. Both speakers emphasised the importance of the Norwegian social democratic tradition, citing social concerns as key influences that directly inform their design process. What was particularly satisfying was the lack of overt iconography, which resulted in architectural responses that were simple and humble. I was left with the distinct impression that these are buildings that would be best experienced in use. What was really striking about all of the work presented was the quality of materials, the refinement of the details and craftsmanship of the delivery. This is not work that has been molested by the dead hand of “value engineering" that seems to cripple so many of our smaller, local public projects. The architecture reflects the confidence of a nation with abundant natural resources, one of the highest earnings per capita on the planet and some of the most beautiful scenery. In many ways Norway is blessed and must be a great place to work as an architect! After the lecture the Norwegian Ambassador officially opened the exhibition which runs until 15th June 2012 at the RIBA. I cannot remember another event where the audience were so attractive; due to the large number of statuesque Norwegians in attendance!